If you would like to make an appointment please call us on the number below or use our online Booking Enquiry Form. The Larch Tree Osteopathic Practice is based at Liam’s home – 49 Larch Tree Avenue in Tile Hill, Coventry, CV4 9FT. Larch Tree Avenue is off Broad Lane and the practice is the second house on the right once you have turned off Broad Lane into Larch Tree Avenue – the Practice is an extension to the side and back of the property and is separate to Liam’s home. There is a small reception/waiting area, washroom/toilet and treatment room. Travelling along Broad Lane away from the city centre. Larch Tree Avenue is the third turning on the left once you have crossed the A45 and passed Wing Wah’s restaurant. Travelling along Broad Lane towards the city centre. Larch Tree Avenue is the first turning on the right once you have passed Jobs Lane. 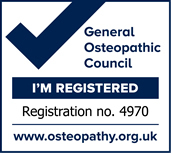 Liam Halton, registered osteopath, is recognised by all major insurers (BUPA, AXA/PPP, Pruhealth, HSA, Physio Link and Norwich Union).